Sending, receiving and viewing attachments is one of the most important ways people use email. In early 2014, we launched a way to preview attachments right in Yahoo Mail without having to download them. 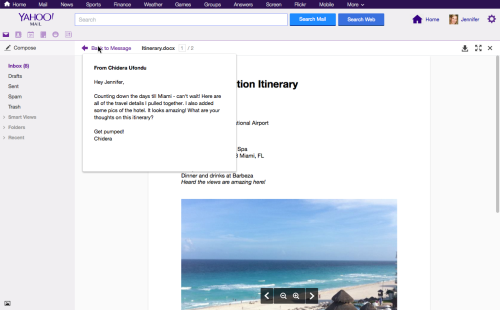 We also recently announced a new way to search and easily attach recent photos and files you have received or sent – right from compose.Previews of attachments in Yahoo Mail has been growing at a fast pace and engagement is off the charts. We love it when our users find value in our features. In the meantime, the industry around document sharing and collaboration has also been growing rapidly. 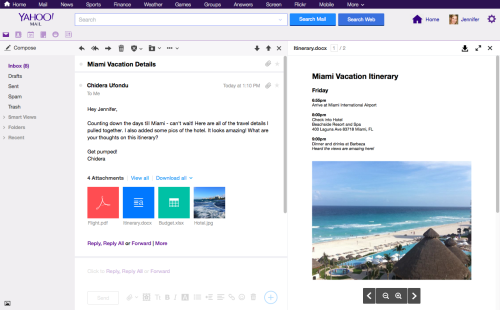 In the fall of last year, we acquired Bookpad (a company working on document previewing and collaboration technology) to build some of the new technology behind Yahoo Mail attachment preview and collaboration. We think there will be a time in the near future where you’ll have all the tools you need in mail, without having to ever download an attachment. Today, we are happy to announce the roll-out and major refresh of the document preview experience and improvements to the underlying technology – making it even faster. Usually when viewing attachments, you constantly have to switch back and forth between reading/composing an email and referencing the attachment. Now, with Yahoo’s new experience, when you click on an attachment, a side-by-side preview will appear so you can read your message or even reply, all while viewing your attachment. We’ve also added an expanded preview mode for those smaller screens and a presentation mode. For PowerPoint, we’ve added a presentation mode so now you can open the slides full screen right within Yahoo Mail. Under the hood, document preview uses native HTML and CSS for better performance since it leverages built-in browser optimizations. This is a shift from SVG/HTML5, which was slower. Previews of documents, including PDFs and Microsoft Office files, are also lightning fast because we convert the attachment to a preview version before you even click on it, saving valuable time. Ctrl+F for expanded preview mode. Ctrl+F again to go to presentation mode. Esc to reverse the process. The new preview experience is rolling out to U.S. users starting today. Let us know what you think!